I still can’t figure out how to embed my videos on my blog! 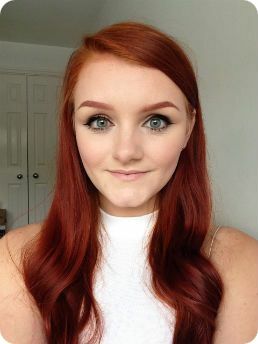 Anyway you can find my latest video on how I do my brows on my Youtube channel – youtube.com/PhoebeGrace92. This Tutorial Tuesday is a bit more outlandish than my others. I was given Illamasqua Lipstick in Pristine after attending the Beauty School Drop In event in Selfridges, and it’s gone into the Illamasqua sale for £7.50 too so why not? Number one is maybe more suited for fancy dress for most people, however two and three are doable for every day or for a night out. Pristine is so easy to blend, it’s perfect to substitute into last week’s smokey eye tutorial. 1. With MAC Rose Gold Pigment pressed on top. 2. Layered over Illamasqua Box Lipstick. 3. Set with Urban Decay Blackout eyeshadow with Urban Decay Verve eyeshadow in the inner corner. I couldn’t wait for you guys to see my new video, so I decided to upload it today instead of Wednesday. I wore this look the other week to go to the Lush Sheffield blogger event and got a couple of comments about the liner. For some reason I still can’t figure out how to get the videos to embed on my blog, so you can find it on YouTube here or you can find me as YouTube user PhoebeGrace92. Like, subscribe or comment to let me know what you think. I’m posting this in a bit of a rush, but here’s today’s Tutorial Tuesday! A full product list will be up tonight. As always, right click then “Open image in new tab” to see a larger, full size version.